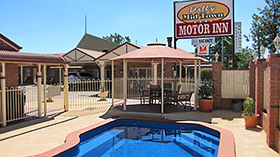 Situated off the main highway, Dalby Mid Town Motor Inn is only 100m from the CBD. Only a couple of minutes walk to clubs, pubs, restaurants, shops and other services. Situated 45 minutes from Toowoomba, 2½ hours west of Brisbane and three hours from the Gold and Sunshine Coast, Dalby sits at the crossroads of the Warrego, Moonie, Condamine and Bunya highways. Follow the Warrego Highway into Dalby. Turn left at the traffic lights on to the Bunya Highway. 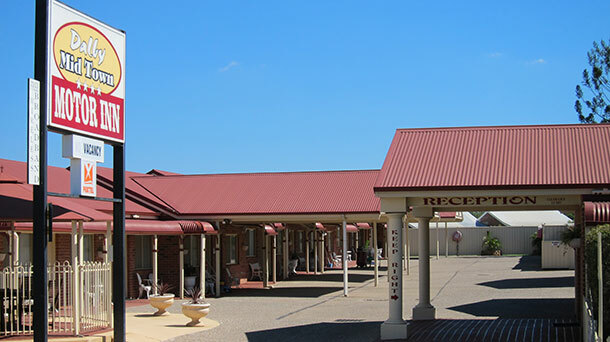 Dalby Mid Town Motor Inn is located 100 meters on the left. Follow the Warrego Highway into Dalby. Turn right at the traffic lights on to the Bunya Highway. Dalby Mid Town Motor Inn is located 100 meters on the left.